Mothers Against Wind Turbines Inc. | Protecting our children from Industrial Wind Power Emissions is our first priority! Wanna go? It should be an interesting discussion about the new World Health Organization Community Noise Guidelines which passed comment about the impacts of noise from industrial wind turbines. Dr. David Michaud lead researcher for the Health Canada Wind Turbine Noise and Health Study 2014 is to be a keynote speaker. In 2018 the World Health Organization (WHO) released the Environmental Noise Guidelines for the European Regions including a conditional recommendation for wind turbine noise that is based on Lden. The Guideline Development Group only considered the wind turbine noise science base published up to 2015. There has been a rapid growth in research in the past 5 years so it is important to test the validity of the WHO recommendation against the totality of research published to date. David Michaud of Health Canada will be the principal speaker in a Forum chaired by Andy McKenzie of Hayes McKenzie and all attendees will have an opportunity to voice their opinions. Infrasound is found within our natural environment but it is the emissions generated by sources such as industrial wind turbines that are raising concerns. There are growing reports of adverse health symptoms from residents whose homes are adjacent to electrical generation complexes powered by the wind. The following letter points out negative health effects arising from exposure to man- made sources of infrasound were known and studied prior to current day rapid expansion of wind powered installations. I congratulate Seneca County for being selected to participate in one of the largest experiments to determine the effects of infrasound on human organ systems. With large numbers of massive wind turbines planned in this densely populated county, medical effects on internal organs can be analyzed. The size of the proposed wind turbines ensures the generation of low-frequency infrasound. The proximity of wind turbines to schools guarantees that as children age, internal organ deterioration can be compared to child control groups from similar demographic locations lacking wind turbines. After 10, 20 and 30 years, researchers can evaluate effects on human internal organs from infrasound. This is important, because western scientific research and medical literature has little written concerning short, or long-term infrasound effects on human organs such as lung, heart and kidney. However, infrasound effects on internal organ tissue have been studied by numerous researchers in the former Soviet Union. They found that infrasound waves cause significant changes to heart tissue and other internal organs. In the 1990s, European investigators studied internal organs in animal subjects and human workers exposed to infrasound. They found significant changes in lung tissue and heart pericardium. The authors also were concerned with potential damage to internal kidney structures. In January 2018, German researchers presented results concerning infrasound effect on cardiac tissue contractility. They found cardiac tissue exposed to infrasound decreased tissue contractility by 25 percent. Seneca County wind farm companies state that wind farm sound levels will only approach 55dbA. That information is misleading concerning infrasound. The“A” designation is a filtration formula including only audible sound between 20Hz and 20,000Hz. Infrasound is defined as occurring between 0-20Hz and is not identified with the dbA formula. With multitude turbines planned, decibel level determination may be problematic. Overlapping sound wave energies add together, similar to overlapping ripples on water from multiple stones dropped simultaneously. Some waves cancel out. Other waves enlarge. Wind turbine numbers become directly proportional to infrasound wave energy multiplication. Also, infrasound waves are stable, traveling great distances. For those interested in their own personal research on infrasound effects, information was obtained for this letter from the PubMed website (Key words: infrasound AND heart, or infrasound AND physiological effects) and the Wikipedia website. Soviet research, translated from Cyrillic, was obtained from the archives at The National Library of Medicine at the National Institutes of Health, Bethesda, Maryland. Adverse Health Effects, Environment, fighting big wind., harm to wildlife, Health, Unite the Fight! CLEVELAND, Ohio – The project has been on the horizon for a decade and a half: six wind turbines erected in Lake Erie, in the first freshwater wind project in North America. But fervor over the issue is revving up now among boaters, as the developer, the nonprofit Lake Erie Energy Development Co., works through stipulations with the state. The Lake Erie Marine Trades Association — made up of boat dealers, clubs and other enthusiasts — opposes the $126 million, 20.7-megawatt project dubbed Icebreaker, planned for 8 miles north of Cleveland. So does the nonprofit Lake Erie Foundation. Both LEEDCo. and its opponents point to hundreds of pages of documents they say prove their points. The fight is not so much over the six turbines up for state approval right now – but for the wind farm it could precipitate: thousands of spinning blades the Lake Erie Foundation fears will desecrate Lake Erie. An expansion would require more studies and more approvals. Adverse Health Effects, Animals and turbines, Cost Benefit, Direct Effects, Environment, harm to wildlife, Health, Uncategorized, Unite the Fight! Michigan borders on four of the five Great Lakes including a large portion of Lake Erie. Many Michigan residents’ boat on Lake Erie, and many Michigan businesses and citizens live and work along its shores. Only 2.5% of the world’s water is fresh water, and 20% of that is coming from the Great Lakes. “Building wind turbines in Lake Erie will threaten clean water, boating access, one of the world’s best perch and walleye fisheries, bird migration, the safety and health of coastal residents, and so much more,” said Polan. The initial goal of the Icebreaker plan is to place 6 wind turbines, with a final goal of 1,200 wind turbines in Lake Erie, costing an estimated $24 billion. The case against turbines is extensive, including the fact that exploding and burning turbines can be commonplace. Each turbine contains over 400 gallons of industrial lubricants in their gearboxes.Gearbox seals are known to fail and will leak oil into the waters below. But when they burn there is no way to reach and extinguish them. As the 300-foot turbine blades burn, they create toxic emissions polluting the air and waters below. I often get this question: “Why have people vacated their homes, or are feeling sick, around windmills in Brown County”. This is not a unique scenario. Very large industrial-scale wind turbines placed irresponsibly close to families’ home have similar impacts worldwide. The impacts do not discriminate between young or old, rich or poor. Some people are more susceptible to the negative impacts (one consistent correlation is people who are sensitive to motion sickness). This German video does a pretty good job describing the issue. Please note that the turbines in this video are MUCH smaller and less impactful than the 8 Duke Energy wind turbines in Glenmore that were unanimously declared a Human Health Hazard by the Brown County Government Board of Health. Duke’s turbines in Brown County are among the largest in the country placed among the closest to homes. They are 493 feet tall and have 2.5 Megawatt generators (One megawatt = 1,000 kilowatts = 1,000,000 watts). You will also note that the turbines in this German video are over 700 meters (over 2,100 feet) from homes – the turbines in Glenmore are as close as 1,100 feet from homes. Wisconsin Public Service (owned by We Energies) purchases the power from this project and it is regulated by the Town of Glenmore who apparently refuses to enforce the clear and protective language in their own ordinance and conditional use permit. Families are living away from the homes they still own; residents who can not move away have submitted affidavits attesting to the fact that they continue to feel severely ill when around the spinning turbines; and little is being done to bring any relief. It breaks my heart to hear callous comments from well intentioned people that have not experienced the impacts in these homes first hand or even taken the time to talk with the impacted residents. The question I ask these people who don’t understand is why would people make this up. People do not leave the homes they still own and maintain for no reason. They do not want to sleep and do homework in their basements because it is the only place in their homes where they can get a little relief. They do not enjoy coming forward only to be the subject of ridicule and voluntarily devaluing their homes. The symptoms our neighbors express are shared world wide. Even those profiting from renting land to wind developers have sued them because of claims of the unlivable conditions around the turbines. This is a social justice issue – Shirley Wind in Glenmore is arguably one of the most studied wind farms in the country and ample evidence is known on the conditions around these particular turbines. If you would like to know more, please don’t hesitate to call or write me – I can direct you to those that can provide the answers and have first hand experience. Hope some of this information is of value. Thank you for reading this long post. Unser Dorf hat Zukunft? Oder werden unsere Dörfer zerstört?/Our village has a future? Or are our villages destroyed? 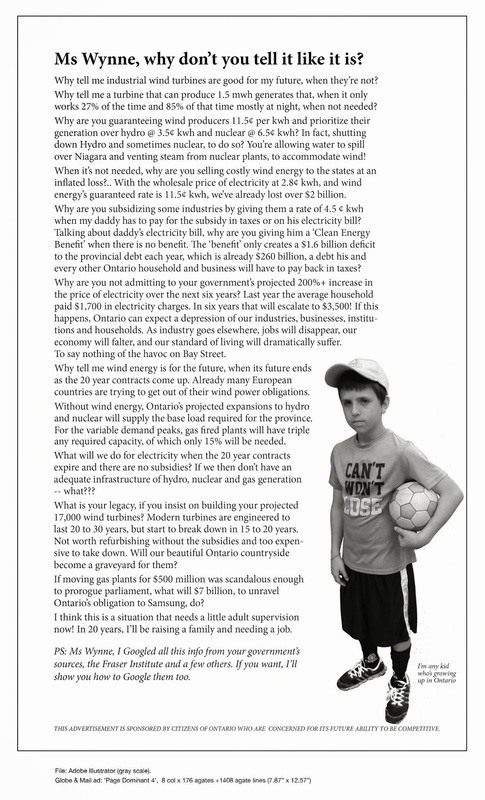 Adverse Health Effects, Charter of Rights and Freedoms, Contracts Cancelled, Environment, Green Energy, legal challenges, Ontario Wind, Unite the Fight! The Green Energy Act is far from being repealed in Ontario. The Charter Challenge led by CCSAGE continues on with the recent filing of a Notice of Application to proceed filed in the Ontario Superior Court of Justice. Wind industry in damage control over avian deaths and significant adverse environmental impacts of avoidance of essential ecosystems such as migration corridors. Reading spin below it begs many questions least is how do dead raptors, birds and bats killed by wind turbines “learn”? Many migrating birds have learned to avoid potentially deadly wind turbines, but this behaviour equals a loss of habitat for the animals, researcher Ana Teresa Marques and others write in the Journal of Animal Ecology. “Soaring birds are among the most affected groups with alarming fatality rates by collision with wind turbines and an escalating occupation of their migratory corridors,” the researchers write. They equipped 130 migrating black kites with tracking devices to trace their travel routes at the migratory bottleneck of the Strait of Gibraltar between Spain and Morocco — an area that is crucial for many bird species and which is also used for wind power production — and found that the animals fly about 700 metres around the turbines, effectively reducing the area available for the birds to migrate by up to 14 percent. “Authorities should recognise this further impact of wind energy production and establish new regulations that protect soaring habitat,” the researchers write. Wind power in Germany has seen increasing resistance in recent years not least due to its possible negative effects on wildlife. Germany’s Federal Agency for Nature Conservation (BfN) recently said that more attention had to be given to the impact of renewable power development on habitats and species. “An ecologically sound renewable roll-out is possible,” BfN president Beate Jessel said. Environmental NGO Nabu estimates about 100,000 birds in the country could be killed by rotor blades each year. To put this figure into perspective: Environmental organisation Friends of the Earth Germany (BUND) says that about 18 million birds in Germany die every year by crashing into windows. Wind energy production has expanded to meet climate change mitigation goals, but negative impacts of wind turbines have been reported on wildlife. Soaring birds are among the most affected groups with alarming fatality rates by collision with wind turbines and an escalating occupation of their migratory corridors. These birds have been described as changing their flight trajectories to avoid wind turbines, but this behaviour may lead to functional habitat loss, as suitable soaring areas in the proximity of wind turbines will likely be underused. We modelled the displacement effect of wind turbines on black kites (Milvus migrans) tracked by GPS. We also evaluated the impact of this effect at the scale of the landscape by estimating how much suitable soaring area was lost to wind turbines. We used state‐of‐the‐art tracking devices to monitor the movements of 130 black kites in an area populated by wind turbines, at the migratory bottleneck of the Strait of Gibraltar. Landscape use by birds was mapped from GPS data using dynamic Brownian bridge movement models, and generalized additive mixed modelling was used to estimate the effect of wind turbine proximity on bird use while accounting for orographic and thermal uplift availability. We found that areas up to approximately 674 m away from the turbines were less used than expected given their uplift potential. Within that distance threshold, bird use decreased with the proximity to wind turbines. We estimated that the footprint of wind turbines affected 3%–14% of the areas suitable for soaring in our study area. We present evidence that the impacts of wind energy industry on soaring birds are greater than previously acknowledged. In addition to the commonly reported fatalities, the avoidance of turbines by soaring birds causes habitat losses in their movement corridors. Authorities should recognize this further impact of wind energy production and establish new regulations that protect soaring habitat. We also showed that soaring habitat for birds can be modelled at a fine scale using publicly available data. Such an approach can be used to plan low‐impact placement of turbines in new wind energy developments. You are invited to live the life of an experience you will always remember. You are invited to bring your family, your grandchildren (young children) and your pets to spend an all expense paid week (bring your computers to enable you to continue to work) in the “green” area of industrial wind turbine business contracts. Experience first hand shadow flicker, low frequency vibration, infrasound, children covering their ears because the noise hurts, computers that work but only when not impacted by turbine activity. Sleeping in the basement is optional. Enjoy the night sky. Red blinking lights that penetrate your lodging, the backyard and the skies for tens of kilometres in the distance (because turbines are sooooo tall you can see them very very far) is one of the most unnatural scenes at night in rural Ontario. As a preview please watch the video to see the view from the USA over Lake Erie to Ontario. The night sky daily looks like a runway, but it is the shoreline littered with turbines. I hope you enjoy the view. Taste sediment-filled water which has been approved for consumption and usage. Clean potable water can be purchased for a costly amount. Experience what so many people in rural Ontario are forced to live with daily. Experience what will happen to the people of North Stormont when you choose to approve the Nation Rise Wind project knowing the outcome. Please note you will not be allowed to leave the premises to sleep in your vehicle should the vibrations become unbearable. You are encouraged to purchase your lodging at a fire-sale price as property values in industrial wind turbine areas are greatly reduced. We, the impacted people, hope you will enjoy your stay and the experience of what we live with daily. We look forward to your offers of purchase. Please advise me of dates available before June 1, 2019 and I will make your arrangements. Following June 1, 2019 there will be a one year waiting period for the construction of the Nation Rise Wind project IF allowed to proceed. Accommodations will be equitable to those presently offered. Animals dying, sick men, two farmers on the verge of financial asphyxiation … Since the installation of a wind farm in 2012 in Nozay, between Nantes and Rennes, state services are clueless in the face of effects secondary as alarming as unexplained. A situation that preoccupies the Ministry of Ecological Transition. In a steady whirring, the blades of wind turbines crack the air, a hundred meters overhanging pastures. The west wind blows and the sky comes alive on this winter Wednesday, around Nozay (Loire-Atlantique), along the N137, which connects Nantes to Rennes. At the foot of eight turbines running at full speed, prefectural orders pile up, nailed to wooden posts. ”  It’s sure our story is a crazy story  ,” sighs, looking right into the eyes, a local farmer. On the side of the prefecture of Loire-Atlantique, it concedes, through the voice of its secretary general, Serge Boulanger, ”  [ we ] are in front of an atypical situation, for which we must find explanations  “. This ”  crazy story  “ today affects dozens of inhabitants of four neighboring municipalities (Nozay, Abbaretz, Puceul, Saffré) and strikes two farms mainly [ 1 ] , installed around wind turbines. ”  We are going to burst in every sense of the term, financially or at the level of our health  “, alarmed the farmer Céline Bouvet, 44 years old, as determined as exhausted by five years of a Kafkaesque fight led to his side. counterpart Didier Potiron, 50 years old. Neither is described as ” anti-wind “ . They even declined all the offers of service of collective opponents.